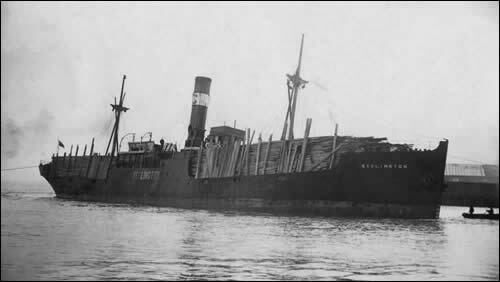 A photograph of the Bedlington Steam Ship from around the 1920's carrying a cargo of wood. Sent in by © Jacqueline Pratt. John Watts wrote: If she is the ship that I think, she was built at Barrow-in-Furness by the Barrow Shipbuilding Company. Launched: 15 January 1884, Owner: Stewart & Co. Length overall 240 Feet, Beam: 34 Feet, Depth: 14 Feet, Engines: Steam. John later wrote: I now believe that the ship Bedlington in the photograph is the one built in 1872 by Coulson Cooke, Wallsend (a forerunner of Swan Hunter). Barrow Shipbuiilding's Bedlington was scrapped in 1894. Clive Ketley wrote: The photograph of the Bedlington is not the 1872 one as this ship has stockless anchors which did not come into general use until the early 1900's. Clive wrote: I've found this information from the Clydesite database which seems to fit your picture of the Bedlington and the G on the funnel would in line with Gjemre Newcastle. The dates 1926-1932 would fit with the picture date of 1920s. Remarks: Laid down 1920 at Lloyd Royal Belge SA, Antwerp (Yd 27) as ARAGONIER but not completed. Sailed Leningrad for Hamburg 29/12/1935, missing, possibly struck a mine south of Styrsudd.